County: Shenandoah, VA General Location: Valley Pike (US11) at Tom's Brook and Jordon Run, I-81, Back Road (rte. Significance: Tom's Brook was a battle of strategy and maneuver that pitted cavalry against cavalry. The CS cavalry were eager for revenge against the US cavalry, which had been burning barns and mills in the Valley for the previous week. On 9 October 1864, however, Sheridan ordered his cavalry to ``whip'' the enemy or get whipped themselves. In the resulting conflict, the US troopers routed the CS cavalry, impairing its morale and efficiency for the remainder of the campaign. The CS flight was referred to by Valley residents and victorious Union troopers as the ``Woodstock Races.'' The fighting on the Back Road at Spiker's Hill pitted two former West Point roommates against one another--Tom Rosser and George Armstrong Custer. Maj. Gen. Philip H. Sheridan watched the battle unfold, reputedly from the summit of Round Hill. Phase One. Disposition of Forces: On 8 October 1864, the Confederate Cavalry under overall command of Maj. Gen. Thomas Rosser harried the withdrawing US cavalry on the Valley Pike and the Back Road, fighting a brisk skirmish along Tom's Brook near the Back Road. The CS cavalry were enraged by the destruction of the Valley they had witnessed in the last week and were attempting to arrest further destruction. Rosser had been dispatched to the Valley from Petersburg to command the CS cavalry and had generally been hailed by the local populace as the ``Savior of the Valley.'' At dark, Rosser halted his division of three brigades (about 2,500 men) on the Back Road in the vicinity of Spiker's Hill and pushed skirmishers beyond Tom's Brook to Mt. Olive. The Middle Road was covered by a force of observation of unknown size. Maj. Gen. Lunsford Lomax's Division of two brigades and a battery of horse artillery (about 1,000 men) bivouacked on both sides of the Valley Pike behind Jordon Run just south of the hamlet of Tom's Brook. Phase Two. US Advance on Valley Pike: Torbert planned to bring an overwhelming force against Rosser's division on the Back Road while holding Lomax's division at bay with a reinforced brigade on the Valley Pike. Lomax's main battle line was deployed behind Jordon Run on both sides of the Valley Pike, supported by six guns. His front line was dismounted, while he maintained a strong mounted reserve on the pike. At dawn, Lowell's brigade (Merritt) advanced to Tom's Brook on the Pike, deployed, and pushed forward ``one-quarter of a mile'' where it found Lomax's main line, dismounted behind Jordon Run. The CS line was supported by six guns placed on either side of the Valley Pike and a strong mounted reserve. While Lowell was engaged, Kidd's brigade rode north along Tom's Brook to connect and cooperate with Custer. Devin's brigade followed but veered off on the Harrisville Road (or overland) and advanced to the vicinity of St. Johns Church, maintaining a connection with the force on the Valley Pike and at the same time extending a skirmish line to connect with the Kidd's brigade on the right. Phase Three. Custer's Advance/ Fighting on Back Road: Rosser dismounted most of his troopers behind Tom's Brook at the base of Spiker's Hill behind stone fences and rudimentary fieldworks (his brigades from left to right, Munford, Payne, and the Laurel brigade). Rosser's six guns unlimbered along the crest of Spiker's Hill slightly behind a second line of barricades. A mounted reserve was maintained on the ridge; the right was extended toward the Middle Road with mounted skirmishers. Advancing beyond Mt. Olive, Custer pushed forward three regiments of dismounted skirmishers against the main CS position. Three other regiments and Wells' brigade were kept mounted and maneuvered for position behind the skirmish line. A battery of artillery unlimbered on the hill in front of present-day St. Matthews (or Sand Ridge) Church and engaged the Confederate artillery on Spiker's Hill. When Kidd's brigade made contact with Custer's left, Custer extended his right flank along the shoulder of Little North Mountain, supporting the movement with a battery. Kidd deployed over the hill, driving Rosser's skirmishers before him, and unlimbered another battery to enfilade the CS position. The Confederate line was gradually forced back into a horseshoe around the front of Spiker's Hill. A regiment of US cavalry (probably of Devin's brigade), moving on the Middle Road from Harrisville arrived on a hill overlooking Sand Ridge Road (intersection of Middle Road) and to the right and rear of Rosser's main force. Reacting to this threat, Rosser ordered a withdrawal. His men raced to mount their horses. At this point, Wells brigade attacked Spiker's Hill up the Back Road, taking few casualties. At the crest, Wells encountered Munford's brigade and a mounted mel‚e ensued. Rosser's force retreated, partly down Back Road to Pugh's Run, partly on Sand Ridge and Middle roads toward Woodstock. Custer's and Kidd's troopers pursued. General Sheridan is said to have watched the action from Round Hill, where there was a US signal station during the battle. Phase Four. Fighting on the Valley Pike: In the meantime, fighting continued along the Valley Pike. Lowell's brigade drove CS pickets back to Jordon Run and deployed on both sides of the pike. The 1st Michigan (Kidd's brigade) supported Lowell's right flank, while Devin's brigade moved farther to the right along the Middle Road beyond St. Johns Church. As Devin maneuvered, Lomax counterattacked down the Valley Pike, driving the Reserve brigade back to Tom's Brook. Lowell, in turn, attacked until stopped by artillery, At last, Devin reached a position from which to operate against the flanks of both Lomax and Rosser. He advanced the 9NY and other elements against Lomax's left and rear (probably down current rte. 657), making Lomax's position untenable. The Confederates began to retreat up the pike toward Woodstock. Phase Five. Rear Guard Action at Pugh's Run: Rosser retreated, losing at least two of his guns at Spiker's Hill. Munford's brigade attempted a stand behind Pugh's Run on the Back Road, but this position was quickly breached. The CS cavalry continued to retreat to Columbia Furnace, losing the rest of its artillery and all of its wagons. Perhaps 150 CS prisoners were captured during this phase of the retreat. Phase Six. Rear Guard Action at Woodstock: Lomax retreated up the Valley Pike to Woodstock, where he was joined by a confused portion of Rosser's command. The forces attempted to stand behind Pugh's Run but were soon scattered. Union troopers pressed forward, driving the CS cavalry to Mt. Jackson. Lomax lost five pieces of artillery and his rolling stock during this rout--two pieces at Woodstock, two at Edinburg, and the fifth beyond Stony Creek. The Union cavalry retired to the vicinity of Woodstock where it bivouacked for the night. The focal points of action were Spiker's Hill where the Back Road crosses Tom's Brook, and the area southwest of the village of Tom's Brook along US 11 (Valley Pike) between Tom's Brook and Jordon Run. The network of roads between US 11 and Spiker's Hill played a shaping role in the unfolding Union strategy. Several vantage points and viewsheds are essential for interpreting the battle: a) view from Round Hill where there was a US signal station at the time of the battle; b) Sand Ridge Church Hill, which allows interpretation from Custer's line and provides a panorama from Round Hill to Little North Mountain; and c) from Spiker's Hill where Rosser concentrated his command. If viewsheds from these three points could be preserved, the battlefield could be interpreted and would retain a high degree of historic integrity and rural setting. Many historic structures remain in the vicinity, including the Peter Muhlenburg Farm (County Alms House) at Maurertown and the Thornton house which served as a stage stop on the Back Road. A 21-acre parcel of Lomax's position across the Valley Turnpike (US 11) has been preserved as a county recreation park. The park offers no interpretation of the battle. Almost all of the battlefield of Tom's Brook is privately owned. There are several immediate threats to the integrity of the above-mentioned viewsheds. A parcel on the summit of Spiker's Hill may be subdivided; survey work has been conducted but as of this writing construction has not begun. Construction of more houses on Spiker's Hill would degrade the viewshed's current high integrity. The area where the Reserve brigade attempted to turn Lomax's left flank was recently threatened by possible subdivision of the Heischmann property (about 150 acres). This property was auctioned in parcels but a local resident acquired the entire property and plans to continue farming. The viewshed from Round Hill may be threatened by development adjacent to the I-81 interchange where there is currently a truck stop complex with peripheral commercial enterprises. The interchange has spurred residential development along rte. 642, south of the truck stop. A portion of land is currently being developed as a subdivision where the Middle Road (rte. 642) crosses Tom's Brook. The I-81 interchange will certainly continue to stimulate further residential development in this area. An L-shaped section of property south of the Truck Stop and I-81 along rte. 651 (about 250 acres) is owned by a local developer who has sought to rezone the property for industrial/commercial/business. Initial requests for rezoning were denied because of concerns over water quality. The impact of development of this section of land on the viewshed from Round Hill should be evaluated; the property near the intersection of rte. 651 and US 11 was part of Merritt's division bivouac area the night before the battle. The strip along US 11 south of the village of Tom's Brook has been developed for a trailer court and other residential housing; a commercial/residential strip runs the rest of the way into the town of Tom's Brook. The right flank of Lomax's line along rte. 650 is lined with trailers and houses, making interpretation difficult. Lomax's bivouac and HQ area in the vicinity of the Peter Muhlenburg Farm (County Alms House) is managed by the county. Efforts to preserve the rural character of the cross roads between Back Road and the Valley Pike (rtes. 653, 655, 657, and 642), which were used as routes of maneuver by the US cavalry, would enhance the battlefield setting. The Battle of Tom's Brook was fought on October 9, 1864, in Shenandoah County, Virginia, during Philip Sheridan's Shenandoah Valley Campaign of the American Civil War. It resulted in a significant Union victory, one that was mockingly dubbed The Woodstock Races for the speed of the Confederate withdrawal. After his victory at Fisher's Hill, Maj. Gen. Philip Sheridan pursued Jubal A. 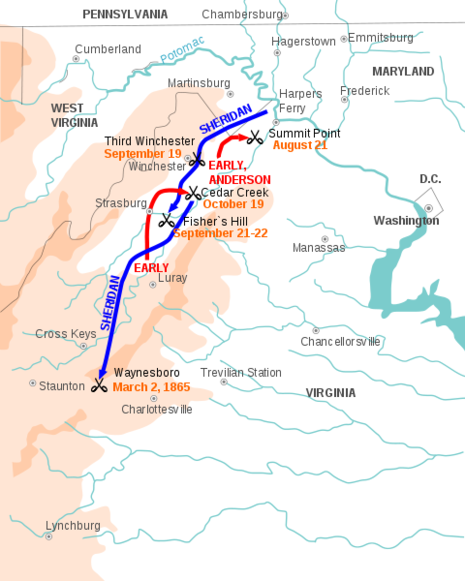 Early's Confederate army up the Shenandoah Valley to near Staunton. On October 6, Sheridan began withdrawing, as his cavalry burned everything that could be deemed of military significance, including barns and mills. Reinforced by Maj. Gen. Joseph B. Kershaw's division, Early followed. Maj. Gen. Thomas L. Rosser arrived from Petersburg to take command of Maj. Gen. Fitzhugh Lee's Confederate cavalry division and harassed the retreating Federals. On October 9, Brig. Gen. Alfred Torbert's Union troopers turned on their pursuers, routing the divisions of Rosser and Lunsford L. Lomax at Tom's Brook. With this victory, the Union cavalry attained overwhelming superiority in the Valley.